Your Sea Trek helmet dive explores Cozumel's pristine underwater world. An astronaut-style helmet keeps your head and shoulders dry the entire dive, and it provides a continuous air supply. Your experienced guide instructs you on equipment, safety and communication before heading to the Sea Trek platform. Explore beautiful coral formations and sea critters of all shapes and sizes. A half-hour later, relax at the beach or swap your helmet for the complimentary snorkeling equipment. 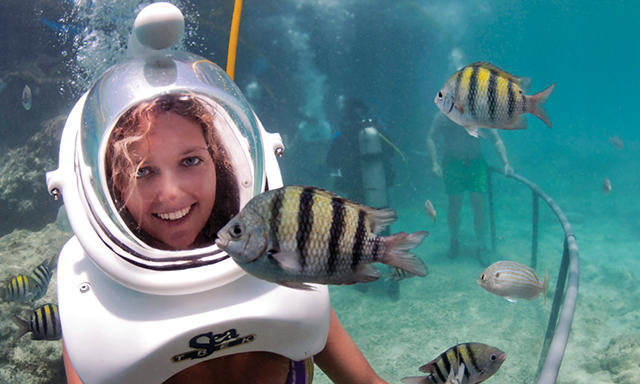 • Sea Trek Helmet Diving: Wear an astronaut-style Sea Trek helmet and dive into Cozumel's underwater world. • Beach Break: Relax beachside after your diving experience, or go snorkeling. • Refreshments: Enjoy two complimentary beverages. • The tour includes snorkel equipment, snorkeling access at "Jeannie's," and lockers for personal belongings. • The tour is 5 minutes away from Cozumel's downtown shops, restaurants and bars. • A signed letter of authorization from a medical doctor to dive will be needed if any part of the waiver form is completed with a yes.